Roof Garden waterproofing services provided by the Dhanasreewaterproofing contractors Hyderabad with the simplest industrial answer. The roof is that the most exposed portion of the house that is exposed to many environmental conditions changes to round the clock that causes varied water leakages. People begin gardening to the roof with plants, grass, and others. They water them on a day after day to stay them recent and healthy. During this method, thanks to daily water usage at identical place water start creating little minute holes and enter the roof or terrace and there you wish the Waterproofing Contractors Hyderabad to rectify the leak drawback. This is often wherever the water leak starts to the various space of it and affects all the ground bit by bit. Hence, garden desires to waterproof to the realm to safeguard roof or terrace from damages. Proper waterproofing within the space of garden can scale back the harm. Garden ought to be shaped with additional care to the ground or terrace. Our waterproofing stops water leakages from the concrete roof and avoids more harm to the house. 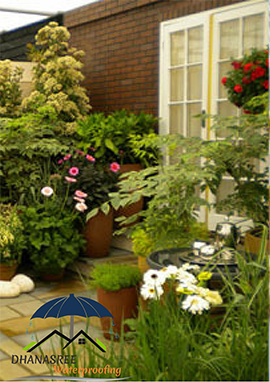 We provide the top quality Roof garden Waterproofing Services in Hyderabad. Purpose of Roof Garden Waterproofing?? In today's times, wherever cities lack gardens so as to form ahouse for housing, wherever high rise buildings and house restrictions have withdrawn the garden from the homes, building a terrace garden with no matter space you have got is that the best resolution to attach with nature. Dhanasree Waterproofing realizes this and provides you solutions to form certain your terrace remains waterproof despite the roof plantation.